Whilst it may not have all the bells and whistles of high end, industry standard, animation software like Harmony, it's still packed full of more than enough features to create professional animation. Particularly for online distribution. Naturally I upgraded pretty much the day I got the email announcement there was a new version. Aside from all the new features, what tipped me into a purchase was a special launch deal to get nearly 3GB of video tutorials and a free Retro Space Content pack (Which I could take or leave. I was interested in the tutorials). In order to make sure I do learn this software beyond the introductory tutorials, I've decided to blog my progress like I did to learn iClone5. The blog posts won't be a learn along with me rehash of the tutorials. If you want to learn the software yourself just get the tutorials and learn first hand. What it will be is a recording of my experiences learning the software, so you can see how easy or difficult I found it. Hopefully, you'll also find it interesting as a kind of overview of how easy Moho is to learn. Despite having a plethora of video tutorials, they're not organised into any kind of logical sequence so that each new video progresses logically from what was taught in the last. Instead, each video teaches a feature or an aspect of the program. So it's hard to know where to start. For example, one directory of video tutorials contains 15 videos for Moho Debut (the cut down version of the software). The first video is labelled 'Getting Started' (seems like a good place to start, right?) but it's not until video 14 you get something telling you about 'Beginners Mode'. It's the same across all the tutorial folders. The order is alphabetical based on video titles and not any kind of logical lesson order. It's confusing and caused me to resort to learning from the written tutorials in the manual when I tried to learn Anime Studio Pro 11. Which is a slow and not particularly fun way to learn so eventually I abandoned my efforts. The thing is, Smith Micro could easily solve the problem just by either releasing a list of the best order to view the videos and/or giving the videos numbered file names, so they arrange themselves in their folder in the correct logical order. Seriously, I feel a lot more beginners would embrace their software if they just did that one thing. Because, as I said, I firmly believe in Moho Pro 12 as being a great animation tool. Just check out some of the new features of the latest version in the video below. Once I sort out the mess of tutorials into some kind of order I'll make a start learning the software. Watch out for future posts of my experiences right here in this blog. Update: Part 2 is now available where I draw, rig and animate my first Moho Character. That's quite okay. I'm perfectly fine with comments and links that are relevant to the article. Tend to delete only generic spam posts and blatant advertising by people offering similar animation services to my own. i was also confuse about the tutorial video order..
i expect 399$ software come with a better QA checks. it is full potential for creating almost anything with very easy and fun tools. 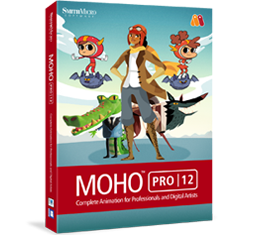 i also have toon boom advanced but prefer to work with Moho ! !